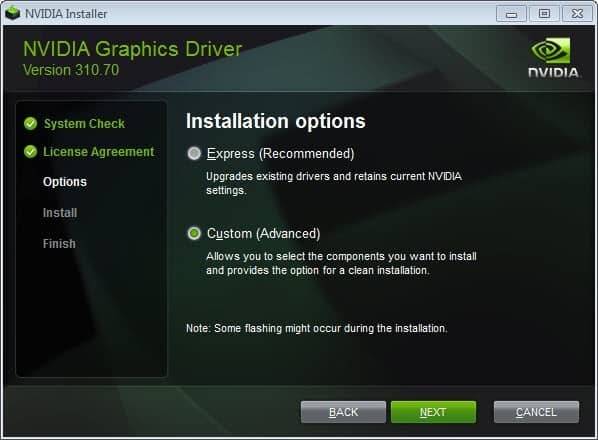 If your computer is powered by a Nvidia graphics card you have probably also installed the driver package that Nvidia makes available for various operating systems. The package has currently a size of nearly 380 Megabyte and one of the reasons for that is that it includes several components and not only the graphics driver. If you select to do a full installation in the installer, you end up with installed drivers for features that you may not be able to use at all. If your monitor does not support 3D for instance, you can't really make use of the 3D drivers that get installed anyway on your system. Another example is the audio driver that you only need if you use the card's audio capabilities. Then there is GeForce Experience, a new software that requires registration. Initially designed to offer configurations for games to improve performance or visuals, it has since been pushed to be a lot more than that. It is now used for instance to download and install updates automatically. Even if you do not use the drivers, they may be loaded with the operating system and features they offer may be displayed in various menus of the operating system. It is therefore highly recommended to custom install Nvidia graphics drivers and not use the express installation option that the installer offers. If you select custom (advanced) installation in the installer you are taken to the next page where you can block several driver components from being installed on your system. While you need to install the Graphics Driver, you are free to block the installation of any of the other components the installer makes available to you. 3D Vision Controller Driver - You only need to install this driver if your screen supports 3D, if you have proper glasses and if you access 3D contents, e.g. movies or games, on your PC. If you do not, do not install this. 3D Vision Driver - See above. HD Audio Driver -You only need that if you want to transmit audio signals via your video cards HDMI connector. If you don't, you do not need to install this driver either. NVIDIA Update (no longer offered) - This resident program checks regularly with NVIDIA if driver updates are available. If you check for updates manually all the time, you do not need the process running in the background on your system. PhysX System Software - If you are into gaming, you may need to install this for some games to run. If you never play games, you do not need this. NVIDIA GeForce Experience - This tool serves several purposes. It checks online to find new drivers, can optimize games so that they run better on your PC, and video broadcasting options. I disable all features but PhysX during installation to avoid installing drivers that I do not need on my system. I suggest - highly - that you also check the perform a clean installation option unless you have created profiles that you want to retain. You can download the latest Nvidia drivers from the official website. 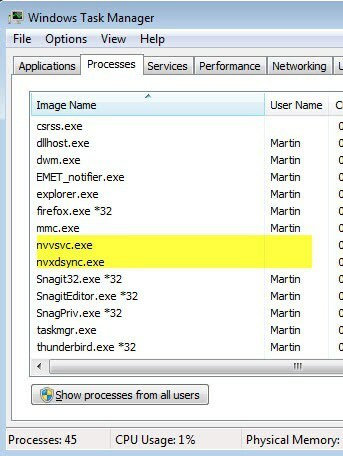 Update: You may notice the two processes nvvsvc.exe and nvxdsync.exe running on your system even after you have only installed the modules that you needed to install using the custom installation option. You can disable both process by stopping the NVIDIA Display Driver Service. When you do that, you won't be able to access the NVIDIA control panel anymore. I have not experienced any other issues doing so however. To disable the service tap on the Windows key, enter services.msc and hit enter. 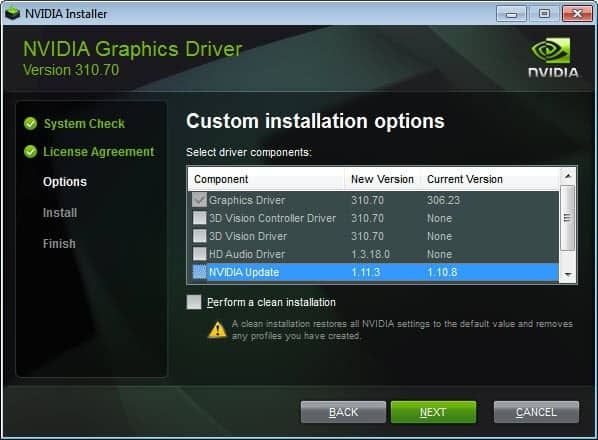 Locate the NVIDIA Display Driver Service, right-click it and select Stop. This stops both processes for the current session. I suggest you do that for a couple of sessions to see if there are any other side-effects of turning the service off. If there are not any, you can go back to Services and disable the service by right-clicking it, selecting Properties from the context menu and switching the startup type to disabled there. Update 2: You may have noticed the processes nvbackend.exe and nvstreamsvc.exe running on the system as well. Follow the link to find out how what they do and how to remove them. Update 3: Recent Nvidia drivers add other processes to the system after driver installation. You find the new NVDisplay.Container process there which powers the Control Panel applet now. Tap on the Windows-key, type services.msc and hit the Enter-key. Locate the service NVIDIA Display Container LS. Click on Stop to stop it for the session. Select Disabled under Startup Type. Find out why you should select custom install during Nvidia Driver installation, and what happens if you don't do it on your PC. Well I do not have an ATI / AMD card right now so can’t really say. It is probably similar to that though. You need to check if there is a custom installation option, and if there is, uncheck everything that you do not need. If you post the elements here I can research them for you if you want. Thanks for the tip. I recently updated my Nvidia drivers, but I used the express installation option. In this case, what would you do: re-install the package but choose the custom option, or individually uninstall the features that aren’t needed? Keith, I’d uninstall the features you do not need in the Control Panel. Thanks, Martin, for this very helpful set of instructions. I replaced my old video card with a much better NVIDIA card a few months ago and just used the Express install because I wasn’t sure which components I could skip. But your little tutorial has shown me exactly what I need to install on my next update, which will be later today. It’s another example of the really useful information you provide that keeps me reading your site every day. You might as well turn this into a full guide about Nvidia drivers and go over such things like proper uninstallation methods of old drivers etc. Is it required to uninstall old drivers before installing new ones? Does one need 3rd party programs like Driver Fusion to properly uninstall left over bits? Whats safe to delete after an uninstall / install? Those can be just some of the questions you can go over, and lots of people always ask about. one of my main principles regarding software: never evet use express install. even if i dont understand every option, at least i know whats being installed. Just for clarification, none of these options are trash. They’re not the usual adware/toolbars you get with various free program’s, rather these options on the nvidia driver packs are all required to support genuine features on the graphics chipsets, it’s just if you don’t use those features then you don’t need the driver components for that specific feature. There is no trash here, only features you may not need which is what the custom install is for. Which means they are trash. It’s just one of the many trash additions that most people don’t even use. Call them “Features” if your want. But they are trash nonetheless. because features you cant afford must be trash. Thanks, Martin, for this article. I’m not such a tech-prof like all of you. I only read again and again “keep your drivers up-to-date” and I ask myself why change anything if things are running smooth. My computer-system is working fine and, I guess, I’m old-fashioned enough to say “never change a winning team”. There are so many different opinions out there that I just think – am I missing something? Well, thanks again for a well-written and enlightening article! While I know this comment is forever ago and I’m not the writer of the article I do know my way around a computer. Keeping graphical drivers updated is important when it comes to playing Games and probably is pretty important to 3D modeling software. If you start experiencing problems, or feel as if your computer should be able to handle certain workloads but isn’t, then it’s probably time to update drivers. Drivers do only go so far though. Eventually you will need to do upgrades to your computer OR get a new one if you are not a DIY kind of person. Thanks for the tip. It is a good advice for every piece of software you install: if available, use custom install (at least that’s what I do and it helps keeping the system clean of unnecessary software). If one of the options from custom install is not clear, you could always search information about it online, so installing a piece of software could turn sometimes into a learning experience :) . ATI/AMD drivers do have the custom install option, which allows you to deselect all unnecessary options. There are also services installed by the nVidia installer, and set for automatic loading, that may not be needed all the time and can be changed to manual loading. The guide linked below is very good at explaining all of this and is updated as new driver versions are released. The nVidia installer also installs sevices and sets them for automatic loading. Those not needed to be running all the time should be changed to manual loading. Link below is to an excellent guide on all of this. It is updated for major driver updates. This article helped solve a frustrating problem with the NVIDIA 4200 in a Dell Latitude 6420. After a re-install both the Dell latest approved NVIDIA driver installer for my laptop and the latest driver from the NVIDIA website installed a version of NVDXSYNC that would max out one core (showing 13% usage on an i7 with hyperthreading on). It must have been using other resources as the system slowed to the point of being unusable. I had done the usual round of safe mode boots and driver re-installs without success. Until I found this tutorial all I could find were malware threads or complaints without solutions. This tutorial listed the services linked to the components and I have now disabled them. No more issues with NVDXSYNC as it no longer starts and I don’t have to trawl through old drivers to find one that works. I probably should have though of checking services, but sometimes you get so caught up in the frustration you forget things….this article was a useful reminder. Thanks. Thanks Martin for this info but any update? The components changed a lot. Wonder which is really needed for a non-serious-gamer. I cannot say if the Framework is needed for all components or only some. What happens if you disable it? I disabled it as I have .Net Framework 2. Working fine! Even this is “bad practise”. You just extract the files from the driver package and install the driver directly from the System Properties / Hardware component. That is the only proper way to do it. This is not always good. For isntance, if you do it with a printer, thinks like duplex printing my not work at all. Uh, not with these drivers I’m afraid… there are lots of control panels and features that are really helpful that you won’t get with a bare driver install. thanks you very much for this information. i’m installing the drivers of my graphic card, but i’m having some problems, i just check two options the Geforce experience and of course the drive of the gpu, but when i begin the stalation, it does not work well, it is stopped in “removing 3D vision driver”. can some one help me? Can you do a 2017 update please! The NVIDIA has incorporated the telemetry service. 2. Add to the registry. 3. Done. No need to reboot. My booting time decreased from 6.5~6.6 seconds to 6.4 stable, on a laptop. I’m a true princess now. Jokes aside, I read 3D vision driver drops FPS and lowers performance. For anyone having a problem with custom reinstalling not showing options, all you have to do hold on the button “Custom install” for a second. I just looked at the contents on the driver download for the first time and had no idea which of the additional components I needed. Turns out I only needed the driver. The 3D components are just ridiculous in my case. Awesome post mate and still applicable in 2017 (although a few minor differences now). BIG THANKS, as it’s saved me a lot time & issues finding out why I’ve got auto updates, and had that 3D crap installed! This needs some additions now that the first step asks if you want to install NVIDIA Graphics Drive and GeForce Experience or NVIDIA Graphics Driver. If the GeForce Experience folders are removed the deployment will fail. Does anyone have any ideas about how to fix this?